Michael Tippett (1905-1998) and Benjamin Britten (1913-1976) were the two giants of British music in the twentieth century. What is often characterised as their bitter rivalry was in truth a firm, lifelong, slightly wary friendship, which would survive artistic and personal disagreements. 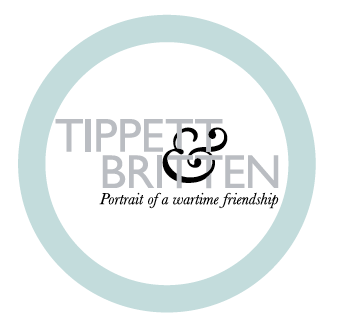 Tippett & Britten: Portrait of a Wartime Friendship tells the story of their relationship at its most intense, during the latter years of World War II. Their lives became politically and creatively intertwined through a series of remarkable events that were dictated by the brutality and hardship of the times. The exhibition features loans from National Portrait Gallery, British Library, and Morley College, collating portraits of Michael Tippett by artists such as Oskar Koskoschka and Gertrude Hermes; also on display is a newly unveiled portrait by Maggi Hambling. Numerous letters and manuscripts are on show, not least the pencil score of Tippett's oratorio A Child of Our Time, on display to the public for the very first time. Copies can be ordered by writing directly to The Red House.